← FINE TUNE WRIST LANYARDS FOR MAXIMUM WORKSITE SAFETY, INCREASED PRODUCTIVITY AND EASE OF USE. Secure Bar Code Scanners, Radios, GPS Systems and Other Heavy Instruments Against Loss or Damage with Gear Keeper® “Magnum®” Retractable Lanyards While Minimizing The Danger of “Dangling Tether” Entanglement. Eliminating entanglement issues, Gear Keeper’s new Magnum series of low profile heavy-instrument retractable lanyards safely tether instruments weighing up to 2 Kg.. Designed for maximum productivity the new Magnum retractables keep instruments close to the body when stored while still allowing complete accessibility when in use. This is particularly important when working in close quarters or climbing. 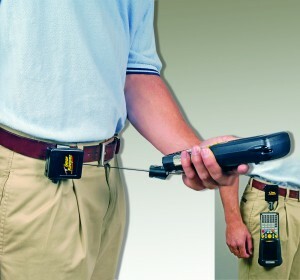 The Magnum retractable lanyards are available in three forces to match the weight of the instrument. Gear Keeper instrument tethers are designed for heavy-duty industrial use with maximum breakage strength and durability. Workers at retail stores, shipping companies, supermarkets and warehouse operations handle bar code scanners on a regular basis, but while these instruments are critical to inventory and tracking systems they are easily broken when dropped and often misplaced or not available when their needed. However, instrumentation tethers from Gear Keeper can prevent loss and damage while making the devices easier to use. Like other retractable tethers in the Gear Keeper line, the Magnum series is engineered so that the instrument, application and recoil/retraction force are in balance. When the lanyard is extended for use, only minimal force is necessary thereby avoiding worker fatigue or in the reverse, causing a ”kick” when the instrument is automatically guided back to its stored position. The RT3-45XX series (Euro 54.99 each) includes a carabiner to attach to a D-ring or belt loop and a carabiner that attaches to the instrument. The models include; RT3-4548 with a 56 cm reach for instruments up to 1.3 Kg. ; RT3-4558 with a 56 cm reach for instruments up to 1.6 kg and RT3-4568 with a 40 cm reach for instruments up to 1.9 Kg. With millions of systems in use, Gear Keeper devices have a failure rate of less than .001 percent. This entry was posted in GearKeeper and tagged avera distributing, Gear Keeper, gearkeeper, RT3-4548, RT3-4558, RT3-4568. Bookmark the permalink. IN CLOSE QUARTERS OR WHEN CLIMBING, RETRACTABLE TETHER KEEPS HEAVY TOOLS CLOSE TO BODY.